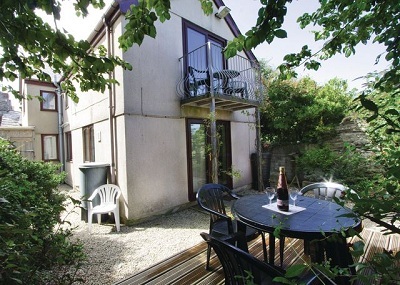 Tromsea Cottage is a two bedroom cottage situated in the popular coastal village of Tintagel in Cornwall. Positioned behind the owner's shop, it is accessed via a side passageway. Tintagel is famous as the home of King Arthur and the Knights of the Round Table and the ancient ruins of the castle still remain. Restaurants, pubs and shops are all in close walking distance. The local beach is safe for swimming and the Trebarwith, which is 2 miles away is very popular with surfers. The accommodation consists of a living room with comfortable leather sofas and satellite TV with Sky and freeview channels. The kitchen/diner is fully equipped with dishwaser, washing machine, tumble dryer, fridge/freezer, microwave, oven, ceramic hob etc. There is one double and one twin bedroom and two bathrooms. A small balcony off the living room has distant sea views. There is all a small enclosed garden with a decking area with patio furniture.